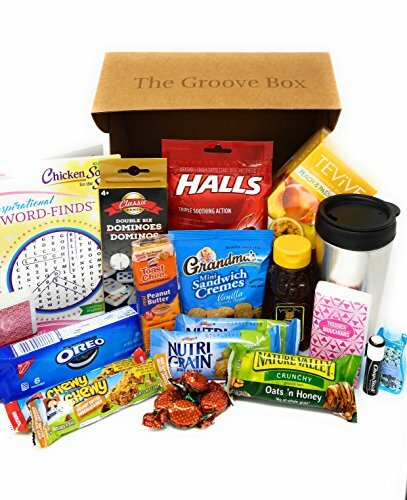 For someone who isn't feeling their best, our Groovy Get Well Groove Box is the perfect cure. This gift includes a variety of comfort items, from quiet games to hot tea with honey. This delightful assortment is sure to lift a family member or friend's spirits! Puzzle book, Stainless Travel Mug, Playing cards, Classic Dominoes, Crackers, Pocket Tissues, Hand Sanitizer, Full Size Box of Herbal Tea, Hall's Cough Drops, Chapstick, Grandma's Sandwich Creme Cookies, Assorted hard Strawberry Candies, 2 Chewy Granola Bars, Nature Valley Oats 'N Honey Crunchy Bars, 2 Apple Cinnamon NutriGrain bars, and a cute Honey Bear. Send a hug in a box and help your friend Get Their Groove Back with a Groovy Get Well Care Package. Send a Get Well Soon Care Package. Whether someone you know is going through a tough time, feeling under the weather or just needs a pick me up, this box is sure to make their day a little brighter. This Thoughtful Care Package includes snacks and recreation for full recuperation, playing cards and puzzle book, assorted sweet and salty snacks to show you care. Bed rest, while rejuvenating, can be a bit of a bore - unless, of course, the Feel Better Soon Get Well Gift Basket is stationed nearby. Men, Women, College Students - this care package is a perfect get-well gift basket. Whether they're bouncing back from an injury or the sniffles, your friend will feel better in an instant when opening this thoughtful gift. Give a smile. This care package is a perfect get-well gift basket for the snack lover under the weather in your life. From Oreos and Granola Bars to crackers to ease an upset stomach. We thought of it all! If you have any questions about this product by Groovy Get Well Box, contact us by completing and submitting the form below. If you are looking for a specif part number, please include it with your message.